There is dramatic change in the landscape during this trek. 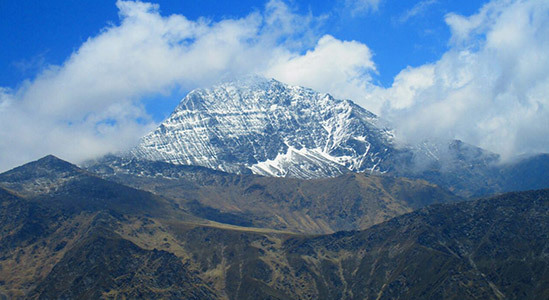 The routes of this trek has been used for many years by travelers and trekkers alike. The difficult level is moderate to high. Scenic row of pine trees on either side of Bhaba Valley create an ecstatic environment that remains in our heart and mind forever. The trek itself tests you with the difficult trails and inclement weather. The blend of the most astonishing destinations Kuari Pass with Pangarchulla peak nestled in Uttarakhand at a higher altitude, the enchanting blend and the experience of two elevations in one trek. The blend of these two treks is so wonderful that takes you to the most beautiful scenic trails and paths. While trekking to Kuari Pass trek and Pangarchulla peak you will come across many small valleys, meadows and profound forest as you head towards your goal. 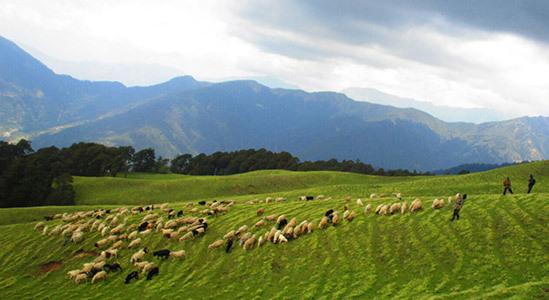 The trek stands best for those are looking for adventure up in the hills, along with the adventurous experience of the two elevations at once. The trek to Kuari pass trek with Pangarchulla peak is graded as easy to moderate therefore the trek can also be done by the beginners, also the trek can be done the whole year, though the trek gives a best experience in winters. This 6 days trek is so wonderful and gives you the feeling of two wonderful elevations to the fullest, the trek of Kuari pass with Pangarchulla peak starts from Joshimath and passes through Dhak village, where you walk through the rocky terrain, as you slowly ascent you will pass through open side cliff villages. The trail is so amazing and the beauty of the region is wonderful the height of both the peaks will make you witness the renowned peaks such as Chaukhamba, Kedarnath, Neelkanth, Haathi Ghodi, kamet, Mana and Dronagiri. One who has an experience of trekking can do it quite quickly, but it will be a little hard for the beginners as the pathway has steeps and the descent will be little hard though there is no compulsion that beginners cannot choose Kuari Pass trek with Pangarchulla peak trek. 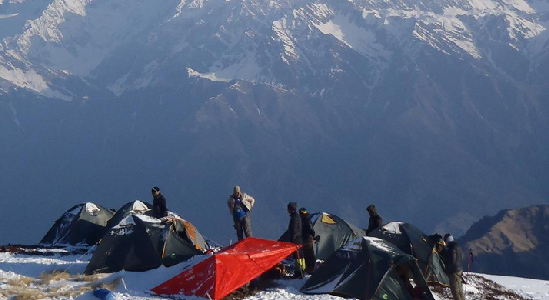 Kuari Pass trek with Pangarchulla peak trek could be the most magnificent and incredible journey for the trekkers amongst all the Uttarakhand Trekking destinations. Somehow, this Himalayan trek is graded as the easy to moderate trek so it can be a choice to take the family to this trek though first-timers can go just in case they have the ability to not giving up, and maintain a decent fitness also, as the Kuari Pass trek and Panganrchulla peak trek has tricky patches, but a well-planned itinerary of the Kuari Pass trek and Panganrchulla peak trek will make it less tiring for the trekkers. 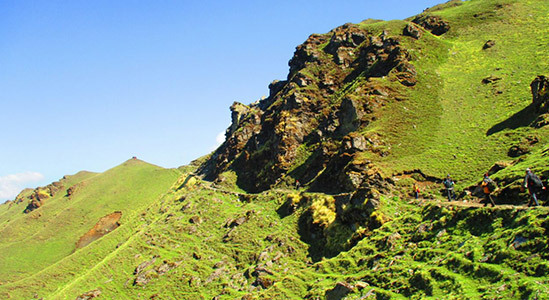 The altitude of Kuari Pass trek and Panganrchulla peak trek is 15,069 Ft. one can attain the maximum altitude depends on the subject to his endurance, and other conditions such as a climate, temperature, The trek will open up the vista of most beautiful peaks and on the higher altitude, everything will look so mesmerizing. 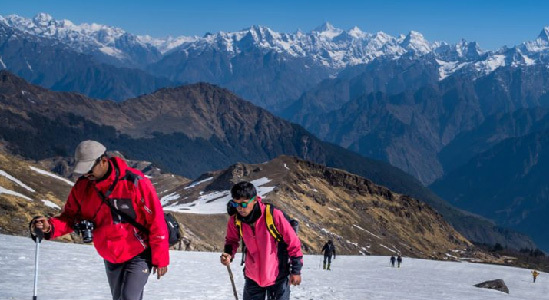 The best season for Kuari Pass trek with Panganrchulla peak trek is from December to March; a trek to this admirable destination can be planned between these months as the destination glows the most, whereas in winters Kuari pass trek and Panganrchulla peak trek wrapped into the blanket of snow. The Destination offers the splendid view; the landscape is beyond imagination, the gigantic mountains wrapped with snow looks mesmerizing. Enriched by the glory of nature Trekking in Uttarakhand can be the best experience in all seasons, where this trekking destination Kuari Pass trek with Panganrchulla peak trek is no doubt a delightful one. During the daytime temperatures will range from around 13-18 degree Celsius during and -3 to -4 degree Celsius at night time. There is a vast difference in the mountain temperature, and when it about the trek to Kuari Pass trek and Panganrchulla peak trek, so it might be possible that one can encounter a little difficulty during acclimatization. It is essential to bring all warm clothes, and that may not even affect the backpack too much. Kuari Pass trek and Panganrchulla peak trek both are is settled at an higher elevation, the trek is the most fantastic that offers the unusual mix of breathtaking adventure and fun, the entire voyage of Kuari Pass trek and Panganrchulla doesn't just a wonderful one but offer the amazing vistas, it makes one forget all the fear in themselves, Kuari Pass trek and Panganrchulla Peak Trek is a sublime trek in Uttarakhand as Uttarakhand has bunches of goal for trekking and there is no uncertainty that each one is thoroughly entrancing, the Himalayas are the shelter for India, like this trekking in India in the most popular. The most exotic trek that opens up the perspective of many renowned peaks capped mountains, and adventure, thrill. 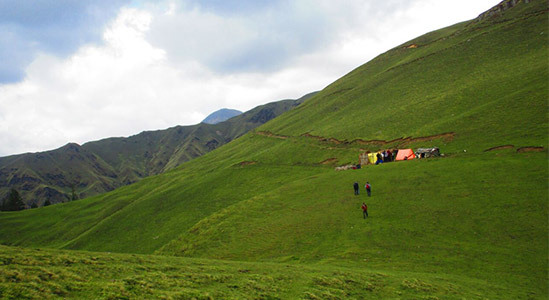 Where Kuari Pass trek and Panganrchulla peak trek in Uttarakhand takes you through the massive mountains and the breathtaking view all through the way it won't keep you quiet by any stretch of the imagination; instead every vista towards Kuari Pass trek and Panganrchulla peak trek will energize you to achieve the goal. The wellsprings that stream downwards and converge with streams all through the way and the snow applauded mountains, alongside the scene in the entire voyage will be treated the eyes of each trekker with the natural gifts. Morning in the lap of Himalayas will fill you with enthusiasm, and you will start your trek today from Joshimath to Dakh to Gulling top, after breakfast. We will begin from Joshimath in the steep ascent you will witness the giant mountains in front of you, and the most pampered mountain which is known as sleeping Lady Mountain, the creation of God is just amazing. Nostalgic moment flood up automatically to leave the place because the memory you’ll leave behind means a lot last day. Trek is not just a sport it gives you courage and teaches you to conquer and sometimes more than that; eventually, it’s all up to you how you’ll take it. Throughout the journey the only thing will be constant that is Mother Nature and its beauty in your mind and soul that have filled you with excitement in the whole trek. Pangrachula With Kuari Pass Trek is a moderate grade trek which can be done by the beginners as well provided they have had their physical and mental work done before at least 2 months. Despite of being a moderate trek, there are certain things that are needed to be taken under the consideration before you head to the Trek. Being moderate in the trekking doesn’t imply the cake walking. People who take the preparation before the trek are the ones who have to leave the trek much before completing it or our trek leaders ask them to return to the basecamp, witnessing their health conditions. Heading to the Trek without prior preparation is something you’re fooling yourself or putting your life under threat. Merely a walking practice for a fortnight or more will never do the magic instead can put your life at risk. The trek expense of Rs. 9,999 + 5% GST takes care of all expenses of the trek from Joshimath to Joshimath. Backpack offloading charges - If you wish to offload your backpack, there will be an additional charge of Rs. 1500 + 5% GST. The backpack cannot weigh more than 9 kgs. Suitcases/strollers/duffel bags will not be allowed. Please note that charges will vary for last minute offloading in case you decide to offload your bag after reaching the basecamp (Rs. 1750 + 5% GST). Online offloading in advance is possible up to two days prior to the trek start date. Excellent service with joyful people, very satisfied with the service and behaviors. We are very satisfied with your service, best wishes for your organization about future. Every things are fine excepted weather we will try for next time with Trekveda.